Uber is the “nastiest, most morally corrupt company ever”. According to the city, [Gene Freidman,] the Taxi King controls 860 cabs (Freidman says he actually operates more than 1,100). That’s more than anyone else in town. Factor in the hundreds of vehicles he has in Chicago, New Orleans, and Philadelphia, and he’s almost certainly the most powerful taxi mogul in the country. Freidman makes money by leasing the cabs to drivers on a daily or weekly basis. 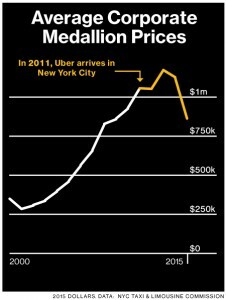 To own a cab in New York, you need a medallion—a metal shield displayed on the vehicle’s hood—and there are a fixed number issued by the New York City Taxi & Limousine Commission (TLC). Until very recently, medallions were a good thing to have a lot of. In 1947, you could buy one for $2,500. In 2013, after a half-century of steady appreciation, including a near-exponential period in the 2000s, they were going for $1.32 million. Then came Uber. Since the arrival of the car-by-app service, valued at about $50 billion, taxi ridership is down, daily receipts have declined, and drivers are idling—or going to work for Uber. Add it up, and desperate medallion sellers are trying to fob off their little tin ornaments for as little as $650,000. This has had a profound effect on Freidman, whose net worth appears to be in free fall. In March, Citibank moved to foreclose on 90 of his medallions, claiming it was owed $31.5 million in unpaid loans. Later, he settled with Citibank on half of the medallions, but 22 of Freidman’s companies owning the other half filed for bankruptcy.